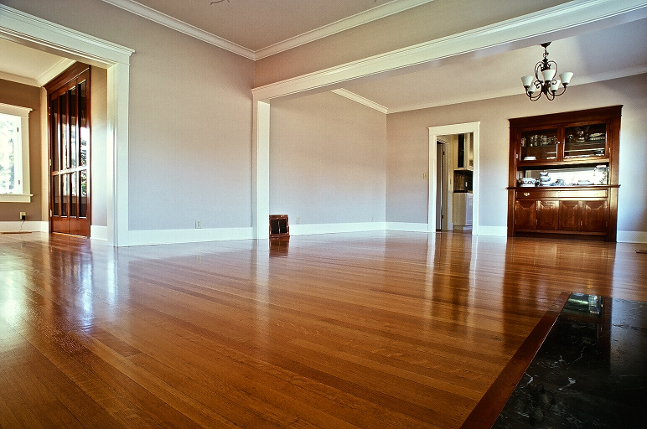 HARDWOOD FLOORING RESTORATION: HISTORICAL TUSTIN, FULLERTON, SANTA ANA, SAN CLEMENTE. 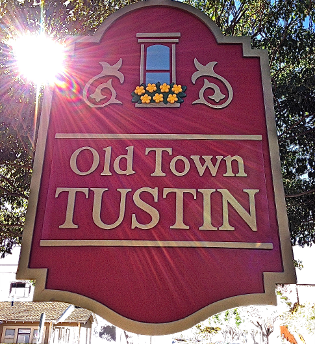 This 1925 Old Town Tustin Craftsman Ranch-Style House has a Quarter Sawn White Oak hardwood floor throughout. My client bought this Midcentury Floral Park Santa Ana House with the hardwood floors as is. The following example shows this badly neglected Red Oak wood flooring; ground in soil and damage due to improper wood floor maintenance. 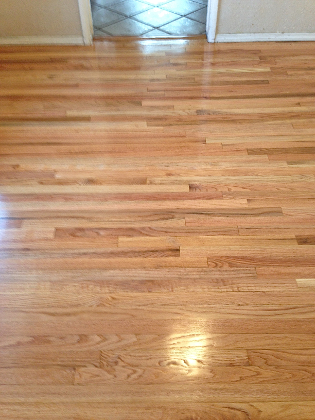 The home buyer hired me to restore his hardwood floor to its original condition as can be seen in the After photo below. 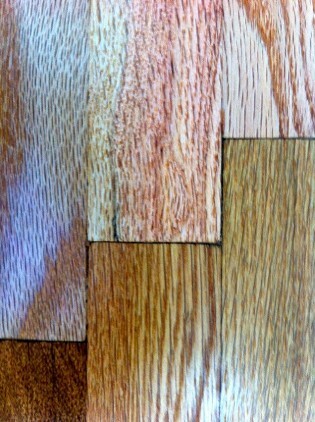 Click onto this PDF link "Clear Up Confusion About Wood Floor Maintenance" for helpful tips. 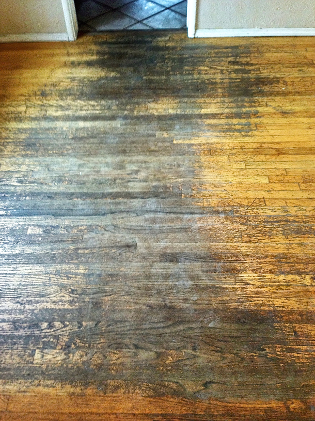 This 1928 Edward Doheny House Hardwood floor was incorrectly repaired over the past years. As it can be seen in photo #1; Red Oak boards (at the top of the picture) were used to repair this White Oak hardwood floor (at the bottom of the picture). Photo #2; shows my ability to correct this error by layering tint over the existing Red Oak repairs in order to blend the entire hardwood floor as if it all were the same species. 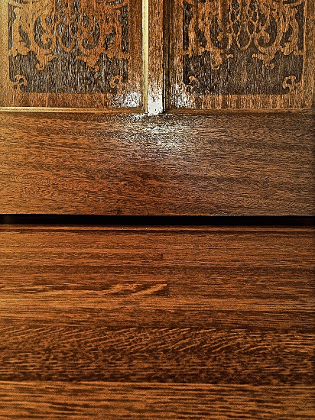 The last two photos illustrate the depth of my dedication in the restoration of this Historic hardwood floor back to its original specifications. Photo #3; shows the manufacturers' label on an existing damaged floor board underneath side. Photo #4; shows the manufacturers' advertisement in a trade journal from that period, (see the bottom of the picture). Although the aforementioned information is not necessary to identify the species, grade and cut; in this case, it did help me in locating the lumber "growing region" *, which improved on the character and color for the additional repairs. 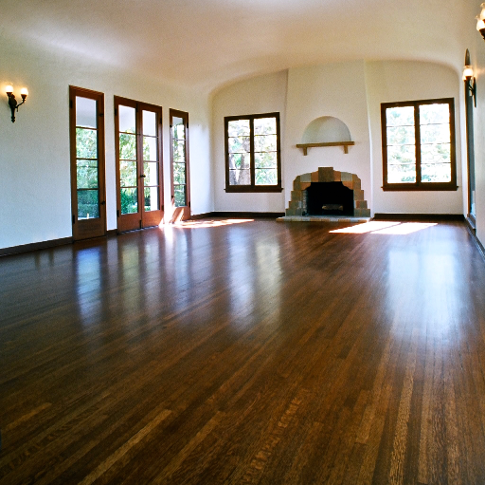 This 1928 Edward Doheny House Hardwood floor was incorrectly repaired over the past years. 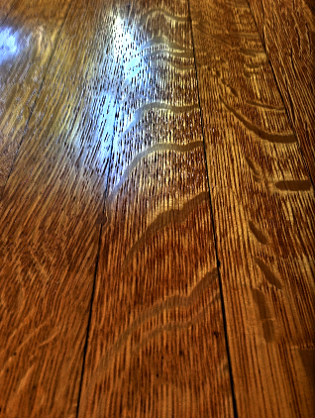 As it can be seen in photo #1; Red Oak boards (at the top of the picture) were used to repair this White Oak wood floor (at the bottom of the picture). Photo #2; shows my ability to correct this error by layering tint over the existing Red Oak repairs in order to blend the entire hardwood flooring as if it all were the same species. The last two photos illustrate the depth of my dedication in restoring historic hardwood floors back to their original specifications. Photo #3; shows the manufacturers' label on an existing damaged wood floor board underneath side. 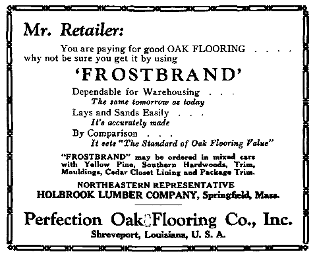 Photo #4; shows the manufacturers' advertisement in a trade journal from that period. Although the aforementioned information is not necessary to identify the species, grade and cut; in this case, it did help me in locating the lumber "growing region* ", which improved on the character and color for the additional repairs. 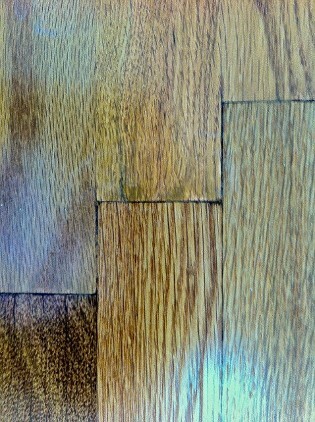 ↓ Photo #1: Before ~ Incorrectly repaired White Oak hardwood floor. See prior Red Oak repair boards at the top of the picture. 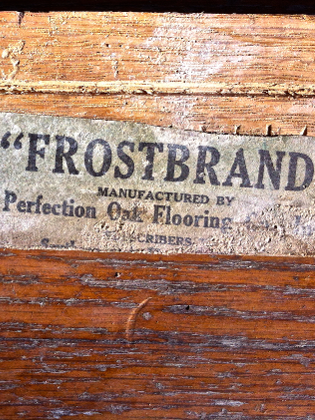 ↓ Photo #3: Historic hardwood floor; manufacturers' label underneath an existing floor board. Also see my Repairs Restoration page.